That I, Majesty Akahu Nui and Akahi Wahine, a living breathing man and woman, being first duly sworn, depose and say and declare by my signature that the following facts are true to the best of my knowledge and belief. 1. 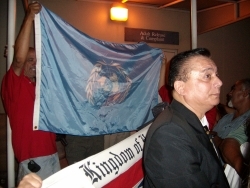 THAT, Linda Lingle as the acting Agent for the STATE OF HAWAII failed to produce evidence that Majesty Akahi Nui is not the 100% Blue Blood Lineal Heir to the Kingdom of Hawai'i Nation and all lands therein. 2. THAT, Linda Lingle as the acting Agent for the STATE OF HAWAII failed to prove that Majesty Akahi Nui is not a direct descendant of King Kamehameha III as documented by Honorable Lorrin Andrews; In the matter of the Estate of His Majesty Kamehameha III, Judge of Probate - Cause Number; 2410 dated April 2, 1853. 3. THAT, Linda Lingle as the acting Agent for the STATE OF HAWAII failed to prove that all land and property recorded and filed within Financing Statement No. 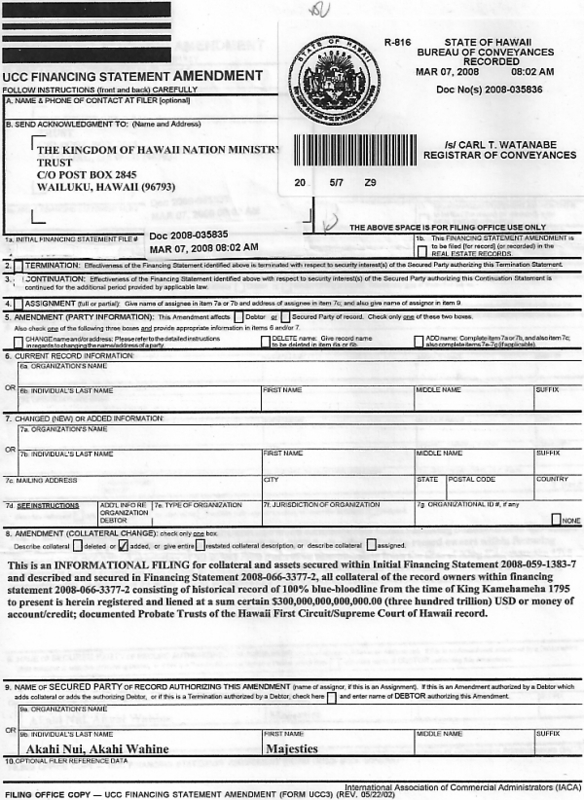 : 2007-287-2418-3 and 2007-192182 is not held, reserved and owned by The Kingdom of Hawai'i Nation by and through Majesty Akahi Nui AND IS NOT HELD IN TRUST BY THE Kingdom of Hawai'i Nation Ministry Trust. 4. THAT, Linda Lingle as the acting Agent for the STATE OF HAWAII failed to prove that the filing of Financing Statement No. 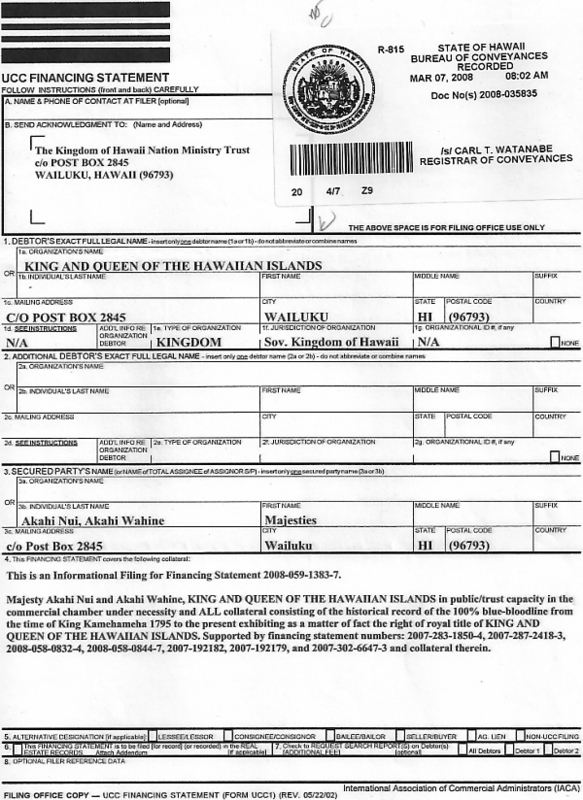 : 2007-287-2418-3 and 2007-192182 which includes ALL Royal Land Patent Deeds and Allodial Patent Lands, does not establish a Superior Security Interest and lien on the property identified therein with The Kingdom of Hawai'i Nation. 5. THAT, Linda Lingle as the acting Agent for the STATE OF HAWAII failed to prove that the ROYAL LAND PATENT DEED No. 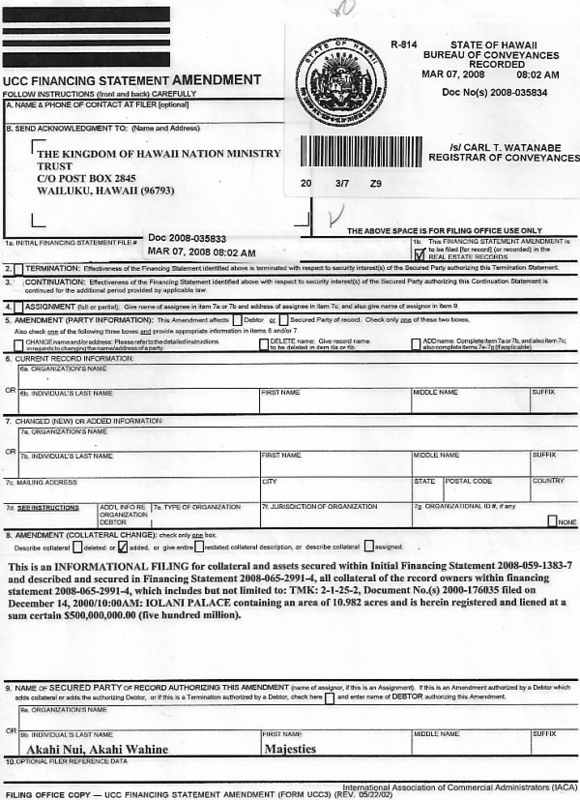 1028 DECLARATION OF CONFIRMATION Document is not recorded and filed with the BUREAU OF CONVEYANCES at 1151 Punchbowl Street, Honolulu, Hawaii 96803-2867. 6. THAT, Linda Lingle as the acting Agent for the STATE OF HAWAII failed to prove that the past and current titles, deeds or otherwise that were sold, bought, transferred, exchanged or otherwise that the so-called 'buyers' did not only acquire a 'Warranty Deed', being a promise as to a clear title. 7. 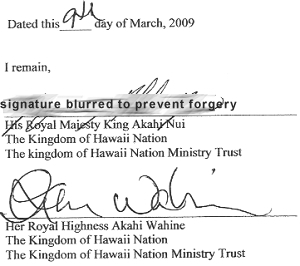 THAT, Linda Lingle as the acting Agent for the STATE OF HAWAII failed to prove that the Sovereign Authority, His Majesty Akahi Nui for the Kingdom of Hawai'i Nation by and through the The Kingdom of Hawai'i Nation Ministry Trust is not the Lawful Holder of the Original Title to the property as described in financing statement 2007-287-2418-3 and 2007-192182. 8. THAT, Linda Lingle as the acting Agent for the STATE OF HAWAII failed to prove that a Public Notice from the Kingdom of Hawai'i through its heir, stating ownership and a Superior Security Interest in the four Hawaiian islands was not published locally, and abroad, exceeding the statutory time limit and was not rebutted, contested or objected to by you and/or your office. 9. THAT, Linda Lingle as the acting Agent for the STATE OF HAWAII failed to prove that a Public Notice, Affidavit of fact, confirming a Superior Security Interest and non rebuttal to same was not published locally and abroad. 10. THAT the Affiants, in their rightful natural state, do not have a submissive relationship and are not indebted with the United States, Federal Corporate government and only under threat, duress or coercion via incarceration and/or imprisonment, have the Affiants been drawn into a submissive relationship with the united States, Federal Corporate government via the sub-agency called the STATE OF HAWAII. 11. THAT, Linda Lingle as the acting Agent for the STATE OF HAWAII did not prove that acting in the corporate capacity as governor of the State of Hawaii did not agree that via said Public Notices, being un-rebutted, stand in the public record as true and that the world at large has not failed to object. 12. THAT, Linda Lingle as the acting Agent for the STATE OF HAWAII did not prove that acting in the corporate capacity as governor, is not in error nor operating in fraud by claiming to have lawful authority to endorse, act for, sign for, assign, and/or otherwise speak on the behalf of the Kingdom of Hawai'i Nation or its people. 13. 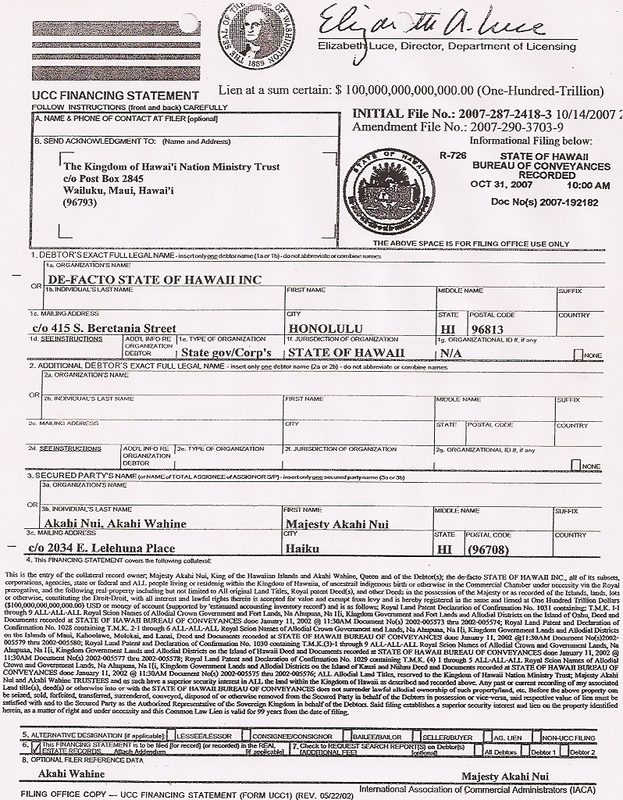 THAT, Linda Lingle as the acting Agent for the STATE OF HAWAII failed to prove that any party, person, corporation or otherwise, including but not limited to ALEXANDER & BALDWIN INC. (A&B INC.), or any other person or entity at anytime has produced lawful title superior to that held by Majesty Akahi Nui's. 14. THAT, Linda Lingle as the acting Agent for the STATE OF HAWAII failed to prove that Linda Lingle, as acting Governor of the State of Hawaii has acted honorably by investigating all the facts dealing with the existence of the 100% Blue Blood Lineal Heir King Majesty Akahi Nui for the Kingdom of Hawai'i Nation before making decisions, choices, executive orders or otherwise and that she does not have a personal conflict of interest in such by perceiving to own land herself within the Kingdom of Hawai'i Nation. 15. THAT, Linda Lingle as the acting Agent for the STATE OF HAWAII failed to prove that Majesty Akahi Nui, does not have Right of Entry, Right of Possession, 100% Ownership and a $500,000,000.00 (Five-Hundred-Million) Security Interest (lien) documented within Financing Statements: 2008-059-1383-7; 2008-035834 and 2008-035833 to the IOLANI PALACE. 16. THAT, Linda Lingle as the acting Agent for the STATE OF HAWAII failed to prove that Linda Lingle, does not need to remove herself and company from the building known as "Washington Place" as it is meant for the de jure Hawaiian government and Royalty. 17. 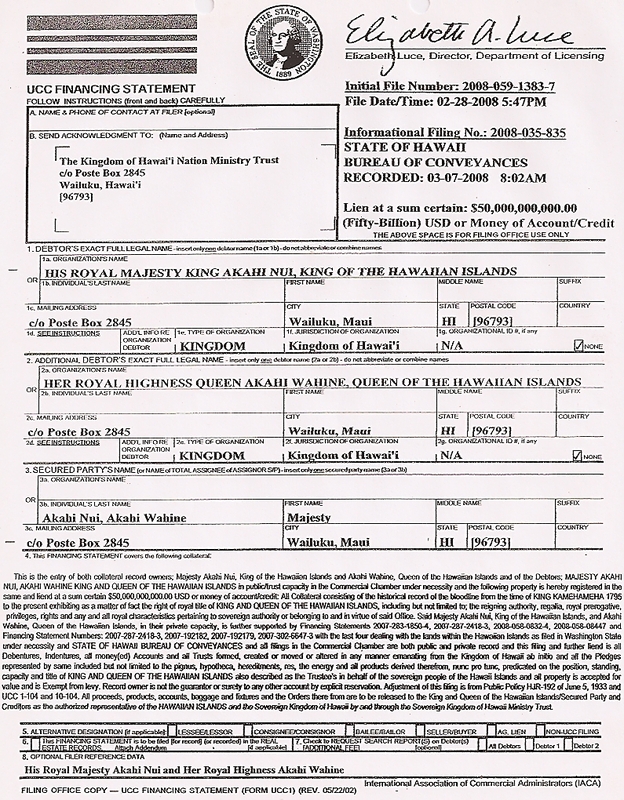 THAT, Linda Lingle as the acting Agent for the STATE OF HAWAII did not prove that Majesty Akahi Nui, a direct descendant of King Kamehameha III does not have a lawful Right, as 100% Lineal Heir, to be in full control and Rein as Sovereign Authority and King over all of the Kingdom of Hawai'i Nation, including but not limited to every acre of said soil, land and property of and within these Hawaiian Islands.